Physicists envision that the future of quantum computation networks will contain scalable, monolithic circuits, which include advanced functionalities on a single physical substrate. While substantial progress has already been made for a variety of applications on different platforms, the range of diverse photonic states that can be manipulated on demand on a single chip remain limited. This is specifically observed for dynamic time management in quantum devices. In a recent study, now published in Science Advances, Kai-Hong Luo and co-workers demonstrate an electro-optic device, which included dynamic functionalities of photon pair generation, propagation and electro-optical path routing. The device contained voltage-controllable time delay approximating up to 12 picoseconds on a single Ti:LiNbO3 (titanium indiffused lithium niobate) waveguide chip. As a proof-of-principle, the physicists at the interdisciplinary department of physics, optoelectronics and photonics demonstrated the Hong-Ou-Mandel interference with a visibility of more than 93 ± 1.8 percent. The chip developed by Luo et al. in the study allowed deliberate manipulation of photonic states by rotating the polarization. Experiments revealed that the physicists could exert full, flexible control on single-qubit operations by harnessing the complete potential of fast on-chip electro-optic modulation. In the past decade, a range of materials has been used to develop optical circuits for quantum gates, quantum interference, quantum metrology, boson sampling and quantum walks. These circuits were developed on materials including glass, silicon nitride, silicon on insulator and silica on silicon. 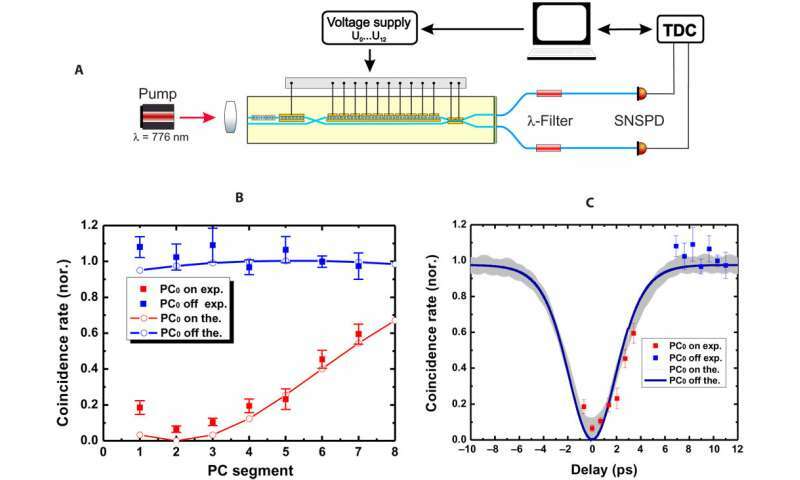 In comparison, the development of integrated photonic devices based on second-order nonlinearities has remained slow, despite the efficiency of exploiting the X(2) nonlinearities. Even with the success of tunable couplers and voltage-controlled phase shifters, the full potential of fast active electro-optic routing and rotation of polarized photons in quantum circuits remain to be harnessed. The aim of Luo et al. was to demonstrate deliberate manipulation of photonic states via precise polarization and time regulation on a single quantum circuit device. For this, they focused on Hong-Ou-Mandel (HOM) interferences, among the most fundamental nonclassical experiments in quantum optics. HOM is at the heart of many quantum logic operations such as boson sampling, Bell-state measurement for quantum repeaters and the Knill, Laflamme and Milburn protocol for quantum computing. 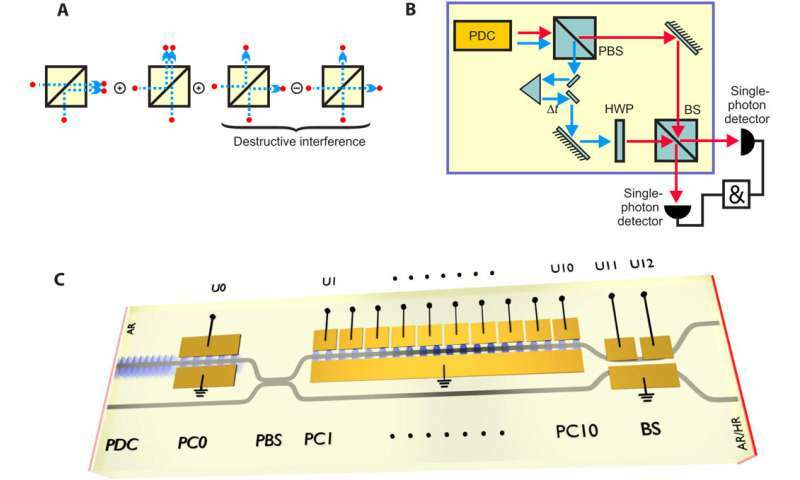 Nevertheless, a practical approach has not yet been produced on an integrated chip to contain all functionalities, and with the ability to manipulate quantum states on demand in the complete HOM experiment. For all quantum logic operations, temporal synchronization of a manipulated state is a fundamental demand. As a result, fast and electro-optically controllable on-chip time delays are crucial inclusions for all quantum applications. The HOM effect can be experimentally produced by a beam splitter (BS). During the effect, two identical photons that enter a beam splitter from opposite input ports bunch together and leave at the same exit port. To demonstrate this quantum effect in an optical HOM experiment, the physicists generated photon pairs (signal and idler photons), and then spatially separated them with a polarization beam splitter (PBS). After polarization rotation and introducing a variable time delay between the photons, they were recombined at a symmetric beam splitter (BS) where quantum interference took place. For monolithic circuit fabrication, the physicists used the Ti:LiNbO3 platform, which exploited the strong X(2) nonlinearity during photon pair generation and electro-optic manipulation of the qubits. Luo et al. then introduced the concept of birefringent electro-optic delay (BED) to overcome an intrinsic birefringent (double refraction of light) delay in the nonlinear medium. The method took advantage of the electro-optic polarization conversion and birefringence of the material itself to allow accurate on-chip time regulation. The complex circuit design contained several different components that were already optimized as individual devices, the scientists fabricated the waveguides by Ti indiffusion for single-mode guiding in both polarizations. Importantly, in the monolithic on-chip electro-optic device, the relative delay between the signal and idler photons required adjustment via the segmented polarization controller. Another important criterion was the length of the entire device, which had to be kept as short as possible to fabricate homogenous structures. 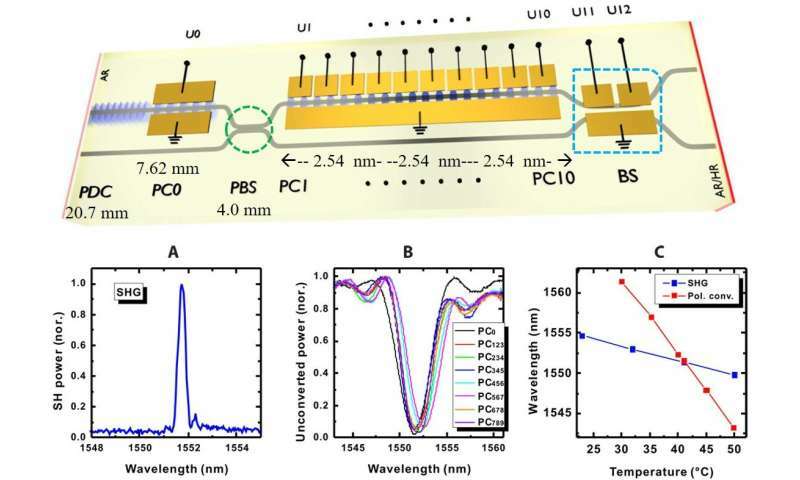 The scientists generated photon pairs in the parametric down conversion (PDC) section (a nonlinear instant optical process that converted one photon of higher energy into a pair of photons), which contained the Ti-indiffused single-mode waveguide. For the HOM chip it was essential for the generated photon pairs to be degenerate. The degeneracy point could be tuned by varying the temperature, with a tuning slope approximating – 0.15 nm/0C. The device contained a specifically designed directional coupler to act as a polarization beam splitter (PBS) to spatially separate the orthogonally polarized photons. Key elements of the BED system developed by Luo et al. included electro-optic polarization converters (PCs). These converters contained a periodically poled waveguide, with electrodes on each side. In the illustrated circuit design of the integrated quantum optical chip, the physicists placed the first PC (PC0) directly behind the PDC section. This was followed by a segmented PC10 (PC1 to PC10; containing 10 electro-optic elements) in one branch, after the polarization beam splitter (PBS) region. The beam splitter (BS), contained two waveguides separated by a 6 µm-wide gap. The scientists illustrated the working principle of the adjustable BED system to show how the calculated group index difference ∆ng caused a temporal walk-off between a pair of photons. Depending on the off/on status of PC0, the polarization states (horizontal or vertical) of the photon pair either remain unchanged or swapped to spatially separate at the PBS to demonstrate the HOM effect. When PC0 was switched on, polarizations of the photon pair swapped to simultaneously arrive at the segmented PC (with 10 electro-optic segments: PC1 to PC10). The scientists showed how the simultaneous arrival of two photons at the beam splitter (BS) could be experimentally achieved. Luo et al. also showed that the relative time delay between the two photons at the input ports of the beam splitter could be finely adjusted between ~ 1.3 ps to more than 12 ps for dynamic time management on the device. The scientists implemented the proposed measurement setup of the entire quantum experiment in the lab by including an external pump, fiber filters and detection units. To confirm that two-photon interference of the study is in the quantum regime for two perfectly identical photons, the coincidence count rates (used to test quantum entanglement) between the two waveguide outputs detected should drop to zero. Additionally, to prove quantum interference, the drop (dip) of coincidences should have a visibility beyond the classically expected value of 50 percent. Luo et al. calculated the visibility of the HOM interference at 93.5 ± 1.8 percent, a value significantly higher than the classical limit, verifying the quantum nature of the on-chip two-photon interference. In this way, the physicists amply demonstrated a quantum electro-optic circuit that could actively manipulate photon states for adjustable time management within a monolithically integrated device. 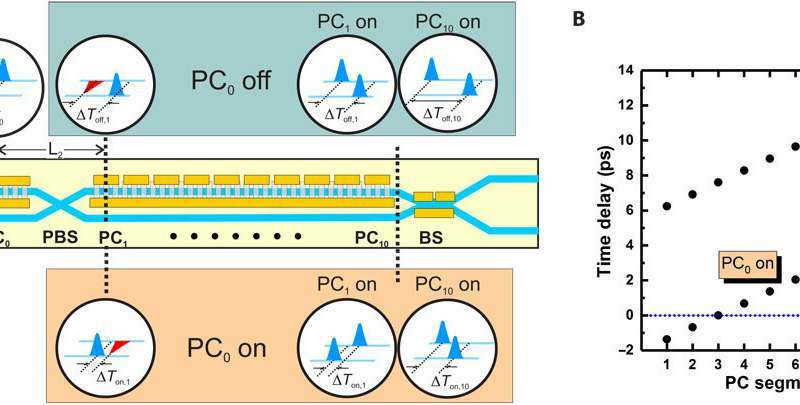 They used a two-photon HOM chip with a source of photon pairs for active polarization manipulation. The work creates a new approach for integrated electro-optic circuits and opens a door to harness the tremendous potential of qubit manipulation in Ti:LiNbO3, for quantum applications. The device paves the way toward future quantum logic operations, hyperentanglement and ultrafast processing seen with fiber-optics, yet rarely used in quantum optics. Excellent article with plenty of good data, pictures, and peer review.